Africanized Bees also called Killer Bees. The Africanized honey bee is closely related to the European honey bee that is used in agriculture for pollinating crops and producing nectar. The two types of bees look the same, have the same venom and behavior. Africanized Bees are likely to defend a greater area around their nest and respond faster in greater numbers, each bee can only sting once. They can sense a threat from animals or people 50 feet or more from their nest. They nest in small cavities and sheltered areas. 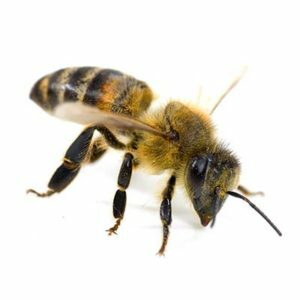 The Africanized bee is not likely to sting when gathering nectar and pollen, but they will sting in defense if provoked or alarmed. All bees become defensive when they settle and begin producing wax, a swarm of bees in flight or briefly in rest seldom bother people. Learn more about bee removal.